Andre “The Bull” Harrison brings home a victory to celebrate Bellmore Kickboxing’s twentieth anniversary. Harrison fought in the co-main event Thursday evening at PFL 4 (Professional Fighters League) against Argentina fighter, Nazareno Malegarie (29-5) at NYCB LIVE Nassau Coliseum in Uniondale, New York. The PFL 4 aired on NBC Sports Network at 9P ET. PFL 5 returns to Nassau Coliseum on August 2, 2018. Harrison, 30, Freeport native, used his wrestling mentality and grinded out another three round victory against his foe. Majority of the fight remained standing as the undefeated fighter backed up Malegarie throughout the three rounds. “The Bull” unleashed combinations on his opponent, connecting on a majority of his strikes throughout each round. Through two rounds, Harrison out-landed his opponent on power strikes 24 to 1 and connected on 81% of his total strikes. 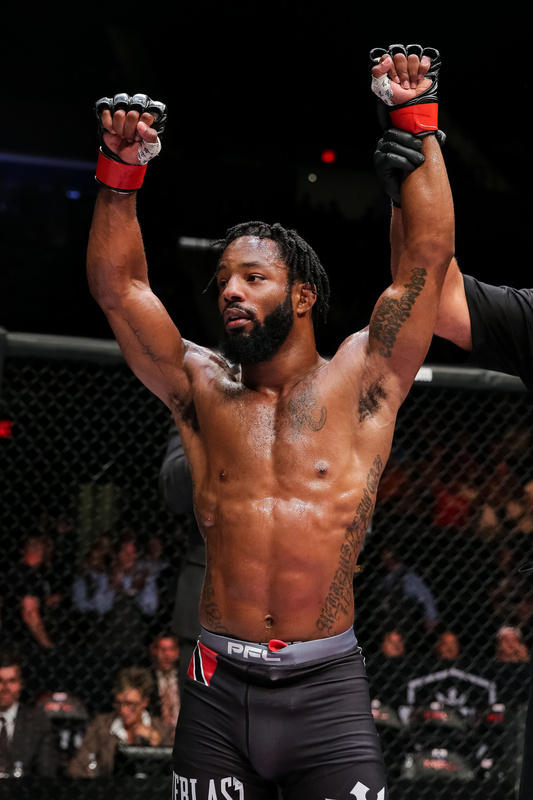 The Long Islander finished up the PFL regular-season with two solid unanimous decision victories, winning all three rounds on the judges’ scorecards. Harrison’s confident but not cocky swagger continues to make him a fan favorite. The former two-time high school Nassau County wrestling champion and Junior College All-American sprawled hard on the South American denying him of any takedown. Malegarie’s left hook was the only strike that found some success against the hometown fighter but wasn’t enough to damage Harrison. Harrison’s success inside the cage is created by a combination of elite level coaching at Bellmore Kickboxing under head coach Keith Trimble, natural athletic ability, and most importantly, hard work and dedication. He attributed his success and Bellmore Kickboxing’s success to the family mentality surrounding the gym. Harrison credits his teammate, Codie Payne, a champion on the amateur circuit, for helping him with all levels of training. Fighting in his backyard, Harrison showed poise inside the cage and explained in the post-fight that rushing in when an opponent is hurt is a great way of getting yourself finished. The Bellmore Kickboxing fighter clinched the number three seed in the PFL featherweight playoffs. Harrison’s two victories, both by way of unanimous decision and winning all three rounds in each of his regular-season bouts earned him the third seed. The NCAA Wrestling all-American has previously defeated the top two seeded fighters in the PFL playoffs. Harrison defeated No. 2 seed Lance Palmer for the World Series of Fighting featherweight title at WSOF 35. Harrison shared a story with the press after his fight, explaining that the last time he competed at the Nassau Coliseum, he lost in the New York State high school wrestling finals by a single point. His victory at PFL 4 brought some closure to those athletic wounds. As the face of PFL and the only undefeated fighter in the featherweight division, Harrison wants to keep the spotlight on himself as he explains if the media attention isn’t surrounding him, it means he’s not winning. PFL playoffs begin in October and the quarterfinals and semi-finals will take place in a single night. Meaning each fighter that wins will have to fight two bouts in a single night. 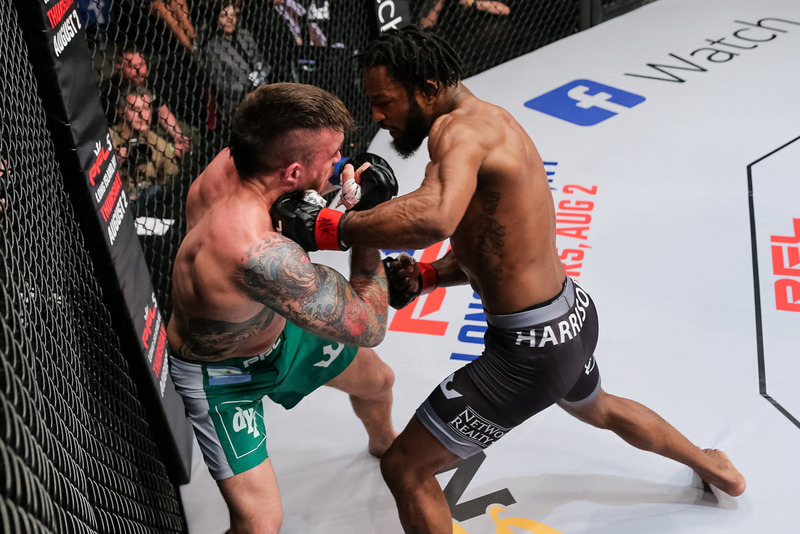 Harrison is seeded number three in the PFL playoffs but is considered the favorite to win the inaugural Professional Fighters League season and the grand prize of a million dollars. Watch below to hear what the undefeated Bellmore Kickboxing PFL fighter has to say about his fight and the upcoming playoffs. Andre “The Bull” Harrison Remains Perfect at PFL 4 – Post Fight Media Scrum. Harrison enters the PFL playoffs as the No. 3 seed. He won two regular-season fights both by way of unanimous decision. 30-27×3. July 19, 2018. PFL 5 returns to NYCB Live Nassau Coliseum on August 2, 2018. The top eight fighters make the playoffs and are seeded one through eight according to their points scored from each of their two regular-season fights. Below are the seeds for every featherweight in the division.